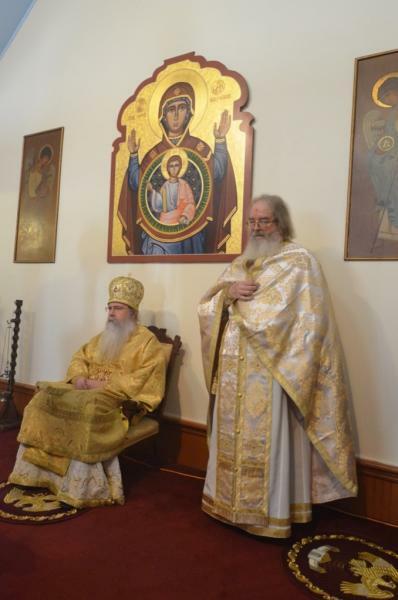 On the weekend of December 19-20, 2015, His Beatitude, Metropolitan Tikhon visited Saint Catherine Church, Hagerstown, MD, a parish of the Orthodox Church in America’s Diocese of Washington. Metropolitan Tikhon was welcomed by Archpriest Dennis Buck, Rector. During his visit, Metropolitan Tikhon placed a new antimension on the altar table and blessed recent renovations made to the altar walls. Gramotas were presented to Marlene Powell and Oleg Salcutan for their years of dedicated efforts on behalf of the parish. 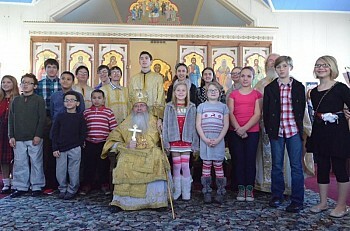 The parish’s children were especially delighted to visit with Metropolitan Tikhon at the end of the Liturgy, at which time he explained the role of the Metropolitan, the meaning and use of the antimension, and how Holy Chrism is consecrated. Saint Catherine’s was planted as a mission in December 1981. Since 1983, when Father Dennis was assigned as the parish’s Rector, the mission attained parish status and has continued to grow spiritually and numerically.